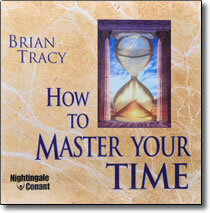 How to Master Your Time CDs by Brian Tracy – Discount! Those who get more done in less time get more out of life . . . more rewards, more success, and more free time to pursue their dreams and enjoy themselves. You don’t have to be cold and calculating to be well organized. Time mastery does not mean letting the clock rule your life. In fact, the very opposite is true: time mastery gives you the absolute freedom to do what you want, when you want to do it. Ironically, you even learn to make time for spontaneity. The more time you make for yourself, the more free time you’ll have. Unlike many programs on time management, this program has no charts, no forms, no daily schedules. Tracy believes in them but knows you are quite capable of developing them for yourself. His purpose in this program is to teach you the philosophy of time management, to help you internalize it, and to help you develop a belief system that will make your every moment more efficient. You’ll make a decision to become excellent at time management . . . to concentrate on the highest pay-off tasks. Your life will simply begin to work better. By becoming a master of your time, you’ll greatly improve the sense of control you have and in turn improve your well-being in every aspect of your life. Remember, time is your most precious and perishable asset. You can begin investing it more wisely. Start today!